OxyCozy Nasal Cannula Wraps are designed with a "button hole" opening to fit all standard nasal cannulas. 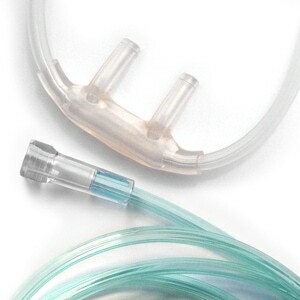 Simply wrap the OxyCozy around your cannula and secure it with the convenient sewn hook-and-loop closures. Super soft OxyCozy Wraps are made from 100% cotton flannel for a luxurious, comfortable feel; and they're available in a selection of great colors -- including white, pink, natural, lilac, blue, and chocolate -- so you can choose the perfect color to suit your personal style. OxyCozy Cannula Covers help prevent the sores, skin irritation and breakdown that can be caused by prolonged oxygen and nasal cannula use. In addition OxyCozy Wraps are great for reducing the red marks and lines that can sometimes plague nighttime oxygen therapy users. 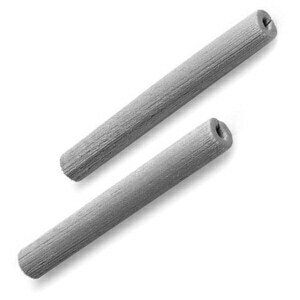 USAGE INFORMATION: OxyCozy Cannula Wraps are removable and reusable. For best performance, wash OxyCozy in warm water with a mild soap. 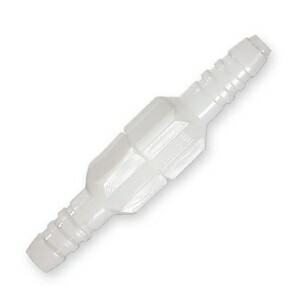 After washing, air dry completely before reapplying it to your cannula. Replace OxyCozy as needed whenever it appears worn or damaged. The fabric is soft, but a bit stiff. It takes some patience to get it on correctly so that the sharp Velcro parts don’t rub you. I’ve had no problem with the prongs not being long enough. Perhaps it depends on the cannula you use. For me it did not help in anyway with the nose irritation caused by my nasal cannula. I was hoping for something to protect the skin on the bottom of my nose. There is no fabric between the prongs. The fabric that surrounds the prongs has very thick stitching that I found to cause further irritation. I rarely use it, as it is a trade off for irritated spots. The wrap offers protection for some issues, however it irritates different spots. I would not recommend it for sleeping. It would probably be fine for use while awake when it’s cold. That way you can readjust and be aware of it causing irritation anywhere on your face. I wish the fabric was more like the pad a cheek cover for CPAP masks. If you're handy with a needle and thread you can make them work. I purchased to help with the lines on my face but the button hole is too thick for the cannula and if I put them (bought 2) around the sides of the cannula they are too long and will not stay in place. I am going to cut them and re-sew to wrap them on each side and I think that will work. Tried to use these cannula wraps and they are so bulky that the parts of the cannula that are suppose to go into your nose, didn't. I tried to use the wrap, but it was to hot on my face. I really like the idea and will try again in the winter. I read reviews and I did not find that it was to hard or that it would not lay correctly, it did. After receiving the wrap and looking at it I think they charge to much money for it and I will not buy anymore unless price drops. In other words just not worth the price. 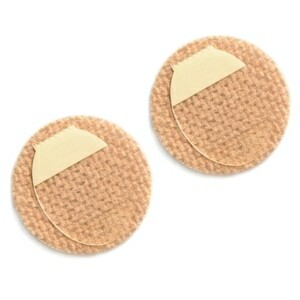 This wrap is a good idea for those who may have a plastic allergy or skin reaction to the plastic cannula. Because my skin can become irritated by the tubing I think they'd also be good cut in-half and placed behind the ears or protect my skin from the tubing that goes along the sides of my neck. The nostrils are blocked and that may bother some. The flannel fabric may absorb moisturizers in the areas of the face where they lay. The velcro is strong but adjustable. I use this mostly at night while I sleep to protect from irritation. Wonderful and fast. I won't shop anywhere else. Love the wrap. I bit to get used to. But when you wake up with no lines on your face. That is a blessing. Should have ordered more. Costly but worth every penny. Too bulky. Cannula prongs don't reach nostrils when this is on. Reported to seller but no refund offered. Threw it away. Bought the product for mom and SHE LOVES THEM!!! Will buy more. Definitely helps me not have the indentation marks on my cheeks from the tubing. Plus the tubing doesn't stick to my face. Comfortable, but it would be nice if they were a little bit longer. These are great! I use Salter cannulas and while I think they're the best they do sometimes cause discomfort on my cheeks and under my nose. I discovered these Cozies recently and they've been a great addition. The pink is a nice shade; and the white is good too. Really a nice addition that makes my oxygen less hospitaly! I was really REALLY tired of my cannulas sticking to my face below my nose. Found these and they definitely help. I would like it if they were a bit longer and I agree that they don't bend around the face as much as I'd like but they're pretty darned good!